Director Kathryn Bigelow has had an interesting career. While she had started out by doing several small projects (i.e. short films and music videos), Bigelow, who was once married to famed director James Cameron (the director behind Titanic, Avatar, and Aliens), began to produce feature films, including the popular 1991 action film Point Break, which starred Keanu Reeves and Patrick Swayze. After crafting a few more films, Bigelow stepped away from directing films before return in 2008 with the critical success of the movie The Hurt Locker, a hard-hitting and restless Iraq War drama. While the film didn’t reach critical financial success like other films that year (i.e. Cameron’s Avatar), Bigelow’s The Hurt Locker was met with much praise from critics and was award with multiple nominations during the award season; winning Six Academy Awards, including Best Picture. In 2012, Bigelow follow-up movie with Zero Dark Thirty, a dramatized version of the decade long manhunt for Al Qaeda leader Osama Bin Laden, which starred Jessica Chastain, Jason Clarke, and many other recognizable faces. Like her previous film, Zero Dark Thirty was met with mostly critical praise from critics and fans, garnishing several nominations at that year’s award season; winning an Academy Award for Best Sound Editing and a Golden Globe for Jessica Chastain for Best Actress in a Motion Picture Drama. Now, roughly five years since Zero Dark Thirty was released, director Kathryn Bigelow and Annapurna Pictures present the newest hard-hitting drama with the film Detroit. Does Bigelow newest project follow the critical success of her past two endeavors or does something get lost within this docu-drama depiction? The year is 1967 and following a late-night police raid on an unlicensed drinking club located on 12th Street, Michigan, on July 23rd, the public disorder within the city’s urban African-American community gave rise to period of violent and destructive riots over the next five days. In response to this, the city of Detroit is placed under a curfew during that period of time, as the local police and National Guard begins patrolling its streets and locals spend their time either criticizing the actions of the police and the government or just trying to keep their heads down, while trying to carry on with their personal day-to-day lives during these turbulent times. On July 25th, taking refuge in the Algiers Motel from the destructive rioting and enforced streets of the city, Larry Reed (Algee Smith, lead vocal singer for the up and coming Motown band “The Dramatics”, and his friend Fred Temple (Jacob Latimore), soon confronted with a dynamic community inside the motel, including two white girls, Julie (Hannah Murray) and Karen (Kaitlyn Dever), enjoying attention from the lively crowd. When one reckless guest decides to fire a starter pistol at local cops and National Guard (across the way from the motel) as a prank joke, all hell breaks loose, with local police officers Philip Krauss (Will Poulter), Flynn (Ben O’Toole, and Demens (Jack Reynor) entering the scene, determined to find the gun and who shot it. Instead of securing the safety of others, Philip and his fellow officers bring panic, and torment down on the motel suspects, trying to use the tactics of fear and imitation to draw out the truths from these scared individuals, while local security guard Melvin Dismukes (John Boyega) is caught in the middle of this investigation, trying to remain civil and compliant the local enforcers while trying to survive this hell-ish investigation ordeal. To be honest, I’ve never seeing any of Kathryn Bigelow’s early work, with the exception of Point Break, which is considered a classic early 90s action movie (not the 2016 remake). To be even more honest, I really never knew she directed Point Break. Like many out there, I really didn’t know who Bigelow was until her film The Hurt Locker was released. However, while I liked the concept idea of the film and the actors in it (Jeremy Renner, Anthony Mackie, Brian Geraghty, and the recognizable cameo-like actor appearances in the film’s supporting roles), I felt like The Hurt Locker was pretty much an overhyped film. It was good, but not super awesomely great like people were making it out to be. That being said, I personally liked Bigelow’s follow-up film Zero Dark Thirty. While some of the narrative pieces were a bit controversial (mostly the interrogating scenes in the first act), the movie was quite intriguing, a strong lead within Jessica Chastain, and an abundance of well-recognized supporting actors (Jason Clarke, Joel Edgerton, Jennifer Ehle, Mark Strong, Edgar Ramirez, James Gandolfini, Chris Pratt, etc.). Given the success and acclaim of The Hurt Locker and Zero Dark Thirty, many critics and moviegoers were pretty intrigued and curious when Kathryn Bigelow announced that her next movie (Detroit) would be about the infamous Detroit riots of ’67. This extends to myself as the award season is right around corner and all the buzz surrounding this movie got me curious to see the film. Naturally, I saw the film’s trailers and, given Bigelow’s two previous works and the film’s subject matter, knew that Detroit was going to be somewhat intense / nail-bitter type of film to watch. So, what did I think of it? Well, while there are some problems with the film, Detroit, thanks to its performances and Bigelow’s direction, makes for an unnerving feature that’s poignant and somewhat palpable to events that echo in today’s current world. It may not be her best film, but its definitely a great addition to Bigelow’s directorial catalogue. With Bigelow at the helm, Detroit is somewhat of a construct of her last two films, showcasing the raw and tension filled of a situation that goes horribly wrong. What sets this film apart from The Hurt Locker and Zero Dark Thirty is that the movie takes place in the United States as the “war on the Homefront” rather than the war “over there” (the middle-east). Since I live in the US and since I use to live in Maryland (only 40 minutes away from when the 2015 protest / rioting took place in Baltimore City), the film’s main setting sort of hits home, especially with today’s current struggle between police and members within the African-American communities (more on that below). To be truthful, I vaguely knew about the Detroit riots of ’67, so it was kind of interesting (and a bit disturbing) to see this particular event being brought under a cinematic microscope, which made me think about the actual real-life event and how it probably was much worse than what Bigelow interpreted. In addition, since the incident of what happened at the Algiers Motel wasn’t heavily documented and only based-on testimonials and words from several individuals, Bigelow, along with her frequent screenplay writer collaborator Mark Boal, takes certain liberties in bringing this story to life; perhaps in the narrative a little bit more of “dramatic” purpose than its real-life account. Some people might be turned off by this, but, given how a lot of “based on a true story” features are like this, it didn’t bother me. It’s definitely an ambitious story to tackle and it seems that Bigelow (and Mark Boal) seem up to the task for such a controversial / sensitive subject matter. As for crafting the film, Bigelow, along with The Hurt Locker cinematographer Barry Ackroyd and production designer Jeremy Hindle, effectively make the film a gritty / hard-hitting real-life horror / thriller that’s set within the in and around the vicinity of the Algiers Motel; creating a sense of claustrophobia and suffocating within some of the film’s tenser moments. There’s also a lot of that handheld camera work that helps the viewer “feel” like you your there, which adds to the suspense and panic of the situation, but this “shaky cam” tactic is a bit overused and becomes a bit nauseated at times. While the film doesn’t carry the same type of adrenaline-filled or nerve-racking action / suspense sequences from Bigelow’s previous two films (i.e. most of the defusing bomb scenes in The Hurt Locker or the compound raid in Zero Dark Thirty), Bigelow still provides enough terrifying set-pieces within the close-quartered walls and rooms within the Algiers Motel or those few moments on the chaotic streets of Detroit. Lastly, the eerie score of James Newton Howard, which is used sparsely throughout the feature, adds to the movie’s dramatic tension. Unfortunately, for all of Bigelow’s ambitious directorial efforts and of the sensitive subject matter (and its context), Detroit does come up a bit short from reaching cinematic greatness. For starters, the film (as a whole) is somewhat mistitled, with many viewers (myself included) believing that the movie was going to sole about the Detroit riots. While the film is set within that turbulent event (smack dab in the heart of it), the movie only utilizes it in the backdrop, with the primary setting of the feature being focused on the events of what happened in the Algiers Motel. Yes, the first 10 or so minutes of Detroit sets up the reasoning behind the riots and shows the overall deterioration of the city of Detroit, but the context of the riots themselves (and their resolution) as well as the city’s government’s role in it all are left unanswered and somewhat disappeared by the time the film enters its third act. 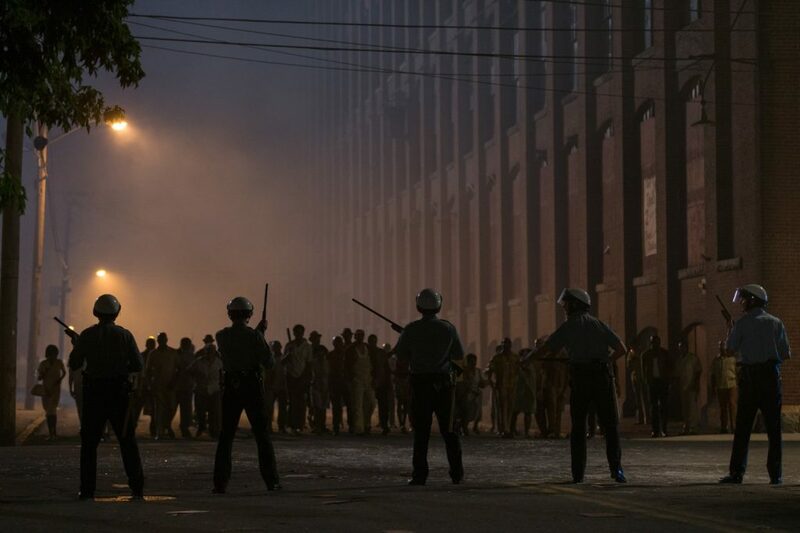 Thus, Bigelow’s Detroit lacks the focus on the larger story at play within this real-life event. Because of this, the film’s subject matter as a sociopolitical commentary is somewhat ambiguous. As stated, the film’s premise is a clear reflection upon the recent accounts of reports of police brutality and racial tensions across the United States. While I won’t deny the illusions to what transpired then and now (as well as its horrible implications in both time periods), the film (as a history lesson) doesn’t really have much to add to today’s modern conversation, especially when the film focuses more on one specific event rather than encompassing the entire rioting of ’67. Some might agree with me on this, while some wouldn’t. So, while I won’t turn my movie review into a sociopolitical debate / discussion about the current situation about today’s police and racial discrimination, I can’t deny the fact that it is a horrible one and I’ll leave it at that. Additionally, the film’s nature can be a bit unsettling. The film’s second act is the really “bulk” of the feature and the main focal point that Bigelow makes for the movie’s narrative. This means that there are plenty of scenes of fearful panic, racial intimidation, and physical beatings that can be unnerving and almost uncomfortable to watch. Think of some of the brutal / harsh scenes within Steve McQueen’s 2013 12 Years a Slave to try and get you within Detroit’s frame of mind. Of course, many viewers will be unsettled by these sequences and possibly angry at what’s transpiring on the screen. Whether that’s by design by Bigelow (most likely) or not, the film will likely leave its viewers emotionally drained and numb by the time the second act wraps up. This, of course, leads us to the third act of the film, which seems more like an afterthought of sorts than a fully realized conclusion. This point of the film intends to wrap up certain character / narrative threads, but, after being put through the movie’s events of the Algiers Motel, a viewer’s attention is so numb and drained that it’s hard to watch. This is in conjunction to the fact that the film itself is very much bloated and overlong, with Detroit’s runtime clocking in around 143 minutes. Thus, while the first act is the setup and the second act is the main plot, the third act gets the short end of the stick, feeling rushed and less emotionally connected to its viewers…. who have been an unnerving cinematic journey. While the negative points are a bit of a drawback for the feature, what ultimately helps a viewer to overlook most of those points is the solid cast that Bigelow assembled to portray these real-life characters (albeit in a cinematic approach). Of course, the three main characters of the feature are found within Larry Reed, Melvin Dismukes, and Phillip Krauss, who are played by Algee Smith, John Boyega, and Will Poulter respectfully. Smith, known for his roles in The New Edition Story, Earth to Echo, and The Infamous, and Boyega, known for his roles in Star War Episode VII: The Force Awakens, The Circle, and the upcoming Pacific Rim: Uprising) make up for the somewhat main protagonist of the feature, with Reed acting as the main thread for most of the feature, while Dismukes is sort of like the arbitrator “by-standers” during the whole “incident” at the Algiers Motel. Additionally, both Smith and Boyega give great performances in their portrayals of their characters, which does help. That being said, probably the most standout performance of Detroit as to be found within its main antagonist Phillip Krauss. Poulter, known for his roles in The Maze Runner, The Chronicles of Narnia: The Voyage of Dawn Treader, and We’re the Millers, does a terrific job as Krauss, playing up his character’s ruthlessness and racial prejudice that effectively works on-screen. His character further drives home the idea of normal person wearing the face of evil (albeit a slightly twisted one) that can be scarier in real life, especially in today’s world, rather than a ghoulish specter from today’s horror-filled movies. The rest of the cast are mostly in the supporting roles, but are just as effective in portraying the ordinary people who just found themselves as either guest at the motel or law enforcement officers. This includes Jacob Latimore (Collateral Beauty and The Maze Runner) as Reed’s friend Fred Temple, Jason Mitchell (Straight Outta-Compton and Kong: Skull Island) as Carl Cooper (the one who initial instigated the whole “incident”), Anthony Mackie (Captain America: The Winter Soldier and The Hurt Locker) as the recent returned-home war-vet Greene, and Hannah Murray (Game of Thrones and Bridgend) and Kaitlyn Dever (Justified and Last Man Standing) as Julie and Karen (the two white women who were among the people involved in the motel incident) and (lastly) are Ben O’Toole (Hacksaw Ridge and The Water Diviner) and Jack Reynor (Glassland and Transformers: Age of Extinction) as Krauss’s two fellow police officers Flynn and Demens. Most of these individuals are good character actors and their talents are reflected within portrayal of these characters. The story of what happened during the Algiers Motel during the Detroit riots of ’67 are brought into a cinematic focus in the movie Detroit. Director Kathryn Bigelow’s newest film continues her recent trend of showcasing journalistic docu-drama narratives to the big screen. While the film is overlong (becoming a bit numbing as the feature goes on), a rushed third act, and hard to decipher its viewpoint within its smaller narrative frame (rather than encompassing the larger narrative), Detroit is still brought to life in a very visceral and dramatic, thanks to Bigelow’s hard-hitting approach, the story’s subject matter, and some solid performances. Personally, I thought this movie was good. Like I said, it was definitely eye-opening to the Algiers situation and nerve-racking to watch, but it was definitely a story worth telling. It was better than The Hurt Locker, but wasn’t as good as Zero Dark Thirty (at least in my opinion). Thus, I would give this movie a solid “recommended” recommendation as well as a solid “rental” as it’s something that should be seeing by many, but doesn’t have tremendous replay value (it’s not one of those films you just pop in and watch on a lazy afternoon or while you’re eating a meal). Echoing to what I said about the film It Comes at Night, Bigelow’s Detroit represents that not all monsters lurk underneath the bed, or are hideous aliens from deep space, or paranormal beings from “the other side”, or even supernatural creatures from darkest legends. Sometimes the monster we fear the most are found within normal “everyday” people….and that’s a scare thing to imagine. Excellent review Jason. I could not give it more than 3 out of 5 stars because I believe it exploits the wave of racial disorder that swept US in the 60s to present a prolonged ‘bad-apple’ account of one psychotic cop. In this way its a gripping drama but poor history. 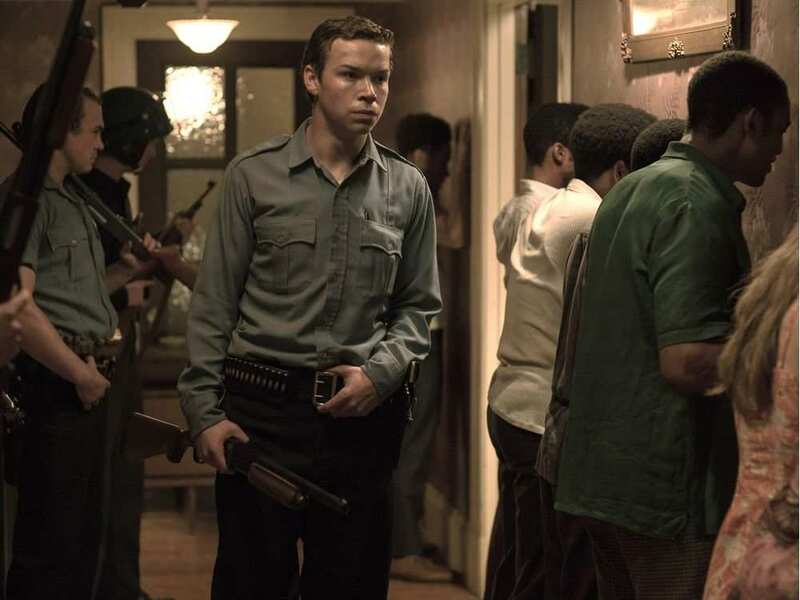 Will Poulter’s tour-de-force portrait of violence and alt-right supremacy is powerful viewing but the rest of the acting is basic. Thank you for reading and for the comment. This movie has faced a lot of different of opinions from many critics and moviegoers. It definitely holds up a very unsettling feeling of racial disorder and does open the subject for debate long after the movie has ended.